The 1980s meant MTV and John Hughes movies, big dreams and bigger shoulder pads, and millions of teen girls who nursed crushes on the members of Duran Duran. As a solitary teenager stranded in the suburbs, Rob Sheffield had a lot to learn about women, love, music, and himself. And he was sure his radio had all the answers. As evidenced by the bestselling sales of Sheffield's first book, Love Is a Mix Tape, the connection between music and memory strikes a chord with readers. Talking to Girls About Duran Duran strikes that chord all over again, and is a pitch-perfect trip through '80s music-from Bowie to Bobby Brown, from hair metal to hip-hop. But this book is not just about music. It's about growing up and how every song is a snapshot of a moment that you'll remember the rest of your life. 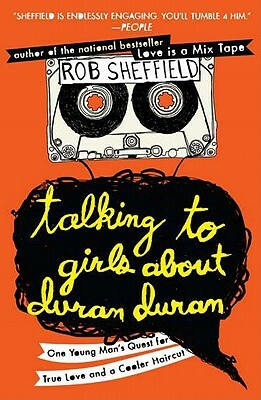 Rob Sheffield has been a music journalist for more than twenty years. He is a contributing editor at Rolling Stone, where he writes about music, TV, and pop culture, and regularly appears on MTV and VH1. He is the author of the New York Times bestseller Love Is a Mix Tape, which has been translated into French, German, Swedish, Italian, Japanese, Russian, and other languages he cannot read. He lives in Brooklyn, NY.